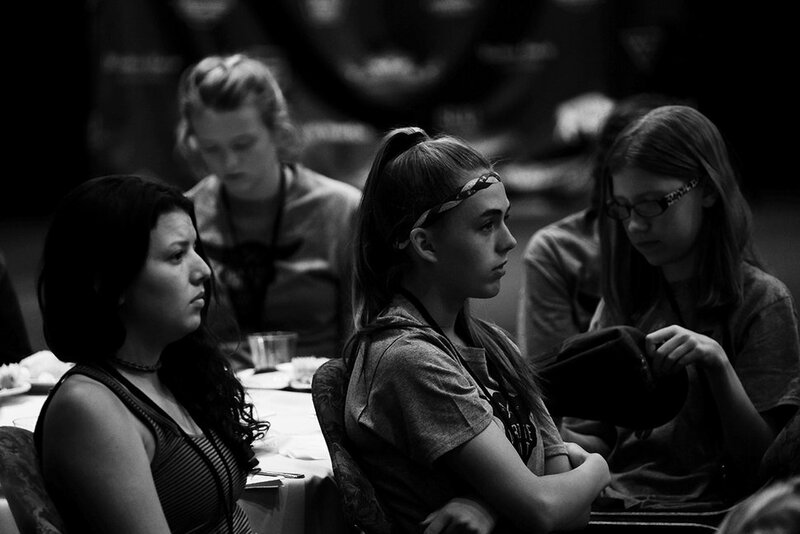 (Photo courtesy of Scott Condie) McKenzie Allen, far left, reads while waiting for the kickoff of the 2017 WriteOut camp in Cedar City. 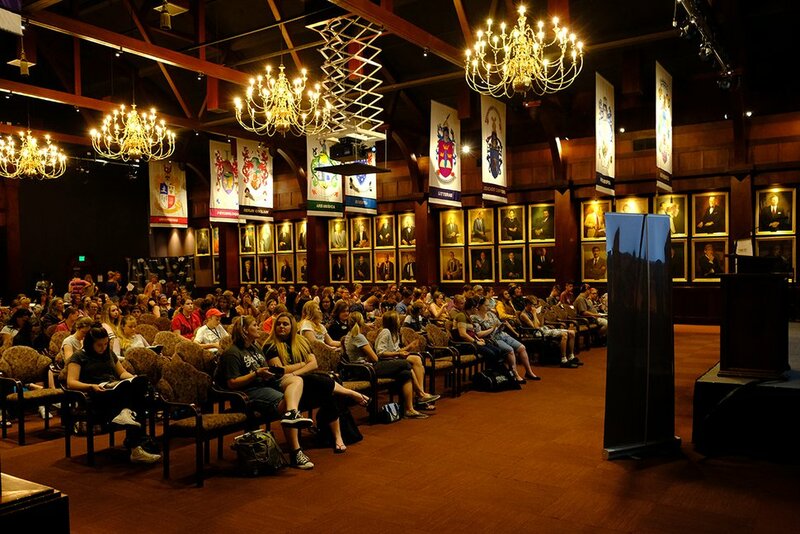 When 14-year-old Ellie Seegmiller walked into a room at Southern Utah University for writing camp last summer, it was full of what seemed like hundreds of kids. Her heart sank. “Oh, crap, I’m going to have to make friends and stuff,” she remembers thinking. Seegmiller, who’s written a book a year since she was in sixth grade, was excited about the chance to work with famous authors during the first-ever WriteOut camp. But she’d been picturing a classroom setting, sparsely populated with a few other kids from Cedar City. It wasn’t just that she got better at writing, thanks to the hands-on mentoring from working authors like Ally Condie and Brandon Mull. She also formed friendships with and learned from kids who’d come from all over the country to hone their skills. (Photo courtesy of Scott Condie) Ellie Seegmiller, far right, reads during WriteOut camp in 2017. Condie, who founded WriteOut, says she was surprised but pleased by the connections formed by attendees. Her goal was that the camp would be one of the coolest experiences these young aspiring writers would ever have — and then they’d go home. 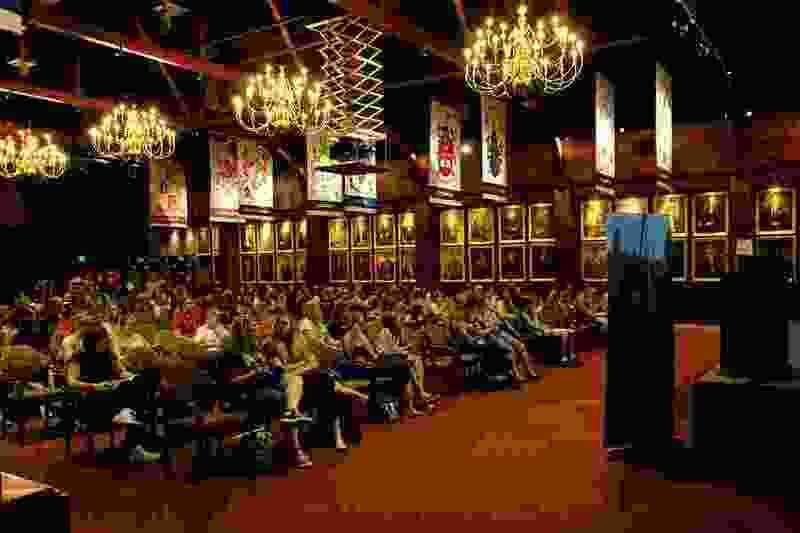 In the year since the inaugural camp, though, many kids have stayed in touch, exchanging story drafts over email and sharing tips about character development and plot. And Margaret Stohl — who co-wrote the best-selling “Beautiful Creatures” series — started a writing group with the 20 kids she’d mentored over the course of the camp. Stohl is returning for the 2018 event, set for June 27-29 at SUU. She and Ann Dee Ellis will be teaching a new advanced track for kids who attended the camp last year, or who may be further ahead in their writing path. Given last year’s enthusiasm, Condie expanded the camp to admit 125 students ages 13 through 18, up from 100. The number of author mentors also has increased, from five to seven, with Ally Carter (the Gallagher Girls series) and Soman Chainani (”The School for Good and Evil”) joining Brendan Reichs and Utah authors Mull, Condie, Stohl and Ellis. The camp’s basic format will remain the same. Writing workshops are interspersed with outings to the Utah Shakespeare Festival and Cedar Breaks National Monument. The campers are also given free time to explore SUU — whether that be in the computer lab, in the swimming pool or in yoga classes with Chainani. 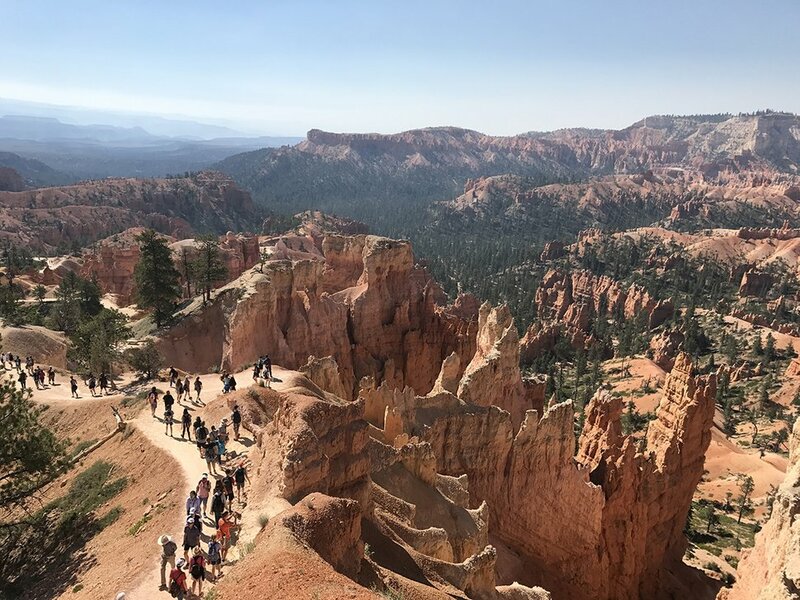 (Photo courtesy of Scott Condie) At the first WriteOut camp in June 2017, best-selling authors, volunteers and 100 teenagers hiked through Bryce Canyon National Park and completed wilderness-writing exercises. The nonprofit is still looking for a corporate sponsor, Condie says. Revenue from registration fees helps organizers break even, but they are all volunteering their time (including Ellie Seegmiller’s mother, Tasha Seegmiller, an SUU professor). Condie’s main goal is that eventually, she won’t have to worry each year whether it will be financially viable to put on the camp again. The pie-in-the-sky hope is to expand the camp to serve other rural areas — maybe in Idaho or Arizona — where children aren’t often exposed to the concept that writing can be a career. Nineteen-year-old McKenzie Allen, a bookworm practically since birth — memorizing the words of picture books before she could read — awakened to that concept when author Suzy Kline visited her Boston elementary school. “I finally put two and two together that people actually wrote books and they didn’t just appear magically in the library,” she says. Kline, who wrote 38 books in the “Horrible Harry” series, showed the students the first “book” she’d ever written, in the first grade. It was a simple story about a horse and a dog who were friends. Allen, then in second grade, realized, “Hey, I could do that” — which maybe meant that she, too, could someday be a published author. In middle school, she wrote a story about the (mostly fictional) adventures of the students in her grade. In her freshman year of high school, she wrote her first book — which she says she’ll never let anyone read. She learned last year at WriteOut that the important thing is to just keep writing. Reichs told her and the others in his group that the first draft of anything is always unlikable — but each draft improves. 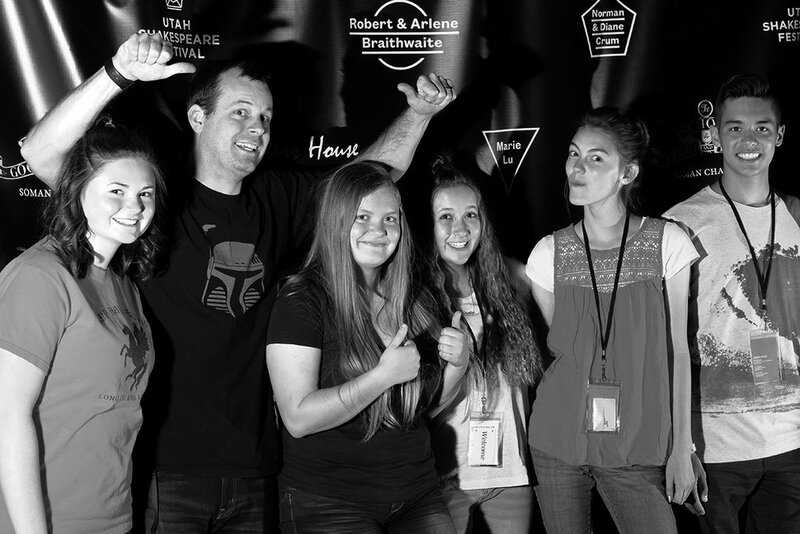 (Photo courtesy of Scott Condie) McKenzie Allen, far left, with author Brendan Reichs and other WriteOut attendees. At 18, she was one of the oldest attendees and didn’t know anyone going in. Just three days later, she and many others were in tears as they said goodbye. They’d found their people, other kids who love writing, and reading, books — and talking about writing and reading books with other people who really get it. She won’t be returning to WriteOut this year — after three semesters at Utah State University, she’s back in Boston and planning to serve a mission for The Church of Jesus Christ of Latter-day Saints. But after seeing how helpful and welcoming Allen and other campers were, Condie decided to make a counselor position for 19- and 20-year-olds. They’ll attend WriteOut for free — except lodging — while assisting authors and looking out for the younger kids during the hike and other activities. Ellie Seegmiller will be returning to WriteOut, taking a break from her summer odd jobs of babysitting, viola instruction and cotton-candy selling. Since last year’s camp, she’s filled two three-subject notebooks with another novel. Finding the words to fill the pages has never been a problem, she says, but the quality has improved thanks to the coaching she got from Ellis last year. “I knew all the different scenes I wanted to have, I just didn’t know how to get from one scene to the next … without giving the reader whiplash,” Seegmiller says. Ellis gave her some tips and techniques for moving smoothly between scenes and introducing characters and their backgrounds. “It was really more advanced than the grammar stuff that you get in school,” Seegmiller says. Not all of her friends she made last year are returning, but she’s not worried. No matter who’s at WriteOut, they’ll have plenty to talk about. Or maybe just sit quietly and write. That works, too.